Spread cubed bread in single layer on baking sheet, and let sit until surface feels dry on most sides, or cubes are firm but not stale-hard, 2 to 6 hours. Rub salad bowl, preferably wood or bamboo, liberally with cut side of half a garlic clove. Reserve the other garlic half for another use. Cut tomatoes lengthwise into quarter-wedges, then cut crosswise into chunky pieces. Place tomatoes and any juice in prepared bowl. For dressing, whisk vinegar, salt and sugar in small bowl until salt and sugar dissolve. Add oregano and 3 to 4 grinds of pepper. Whisk in oil. 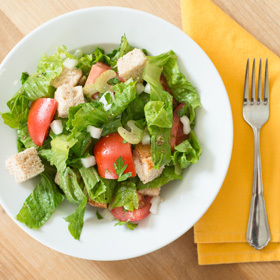 At table, pour dressing over salad and toss until well-coated and any extra dressing pools in bottom of bowl. Divide salad among 4 wide, shallow bowls, including liquid from bottom of salad bowl. Serving size: 1/4 of recipe. Amount per serving: 158 calories, 8g total fat (1g saturated fat), 20g carbohydrates, 4g protein, 4g dietary fiber, 281mg sodium.